Several buildings claim to be the oldest hotel in England, and the Old Bell in Malmesbury is certainly a prominent contender for the title. In fact, there are remnants (including the foundations) of a structure dating from 1220 AD. And that, in any language, makes it an exceptionally old inn. Indeed, it is precisely because of its antiquity and Grade-I listed status that it is featured here in absence of any documented connection to famous historic figures. 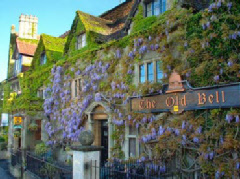 The Old Bell offers 31 guest rooms in all, these being split between the main hotel and the coach house (the former more ‘period’ in feel, that latter more light and airy). Bristol and Swindon are both within easy reach by car to the west and east respectively.